Autumn is my favorite time of year, and I’m always excited by the usual harbingers of Fall … pumpkins, raptor and bird migration, amazing light, crisp electric air, foliage color changes, bay nuts, and an instinct deep within me that drives me to figure out what ridiculous costume I’ll wear for Halloween. 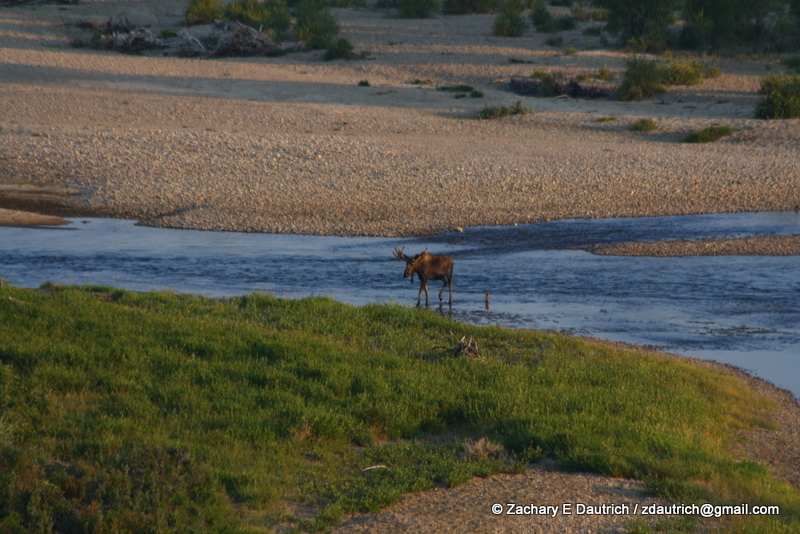 There is also the call of the rutting bull elks, if you’re lucky enough to be close to some – a sound that reminds me of whale calls penetrating the surface of the water and echoing across the landscape. I love to see and hear them, especially at this time of year, when the bulls have their “harems” of cows protectively corralled close to them. If one tries to stray too far, the bull will herd her back. And if another male comes too close, a fight can ensue. They make their bellowing, haunting calls often, seemingly to advertise their virility to the females and their dominance over other bulls -with the occasional chirping siren-like responses from the females, and other males calling back to defend their own space and ladies. It’s all about the ladies at this time of year. 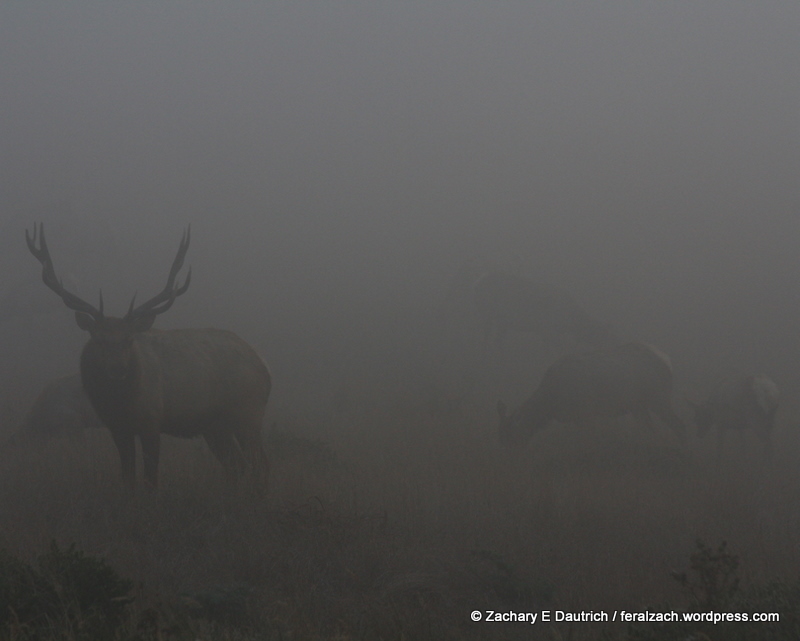 On Sunday we visited the herds at Tomales Point to immerse ourselves in this Autumn rite, and though initially we were disappointed by the thick fog that enveloped just the very tip of the peninsula where the elk live, it turned out to be a good thing. 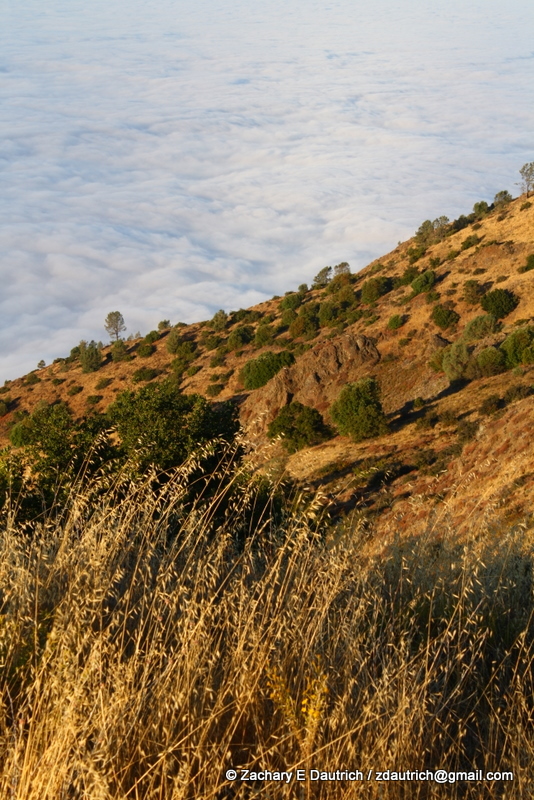 Fog is one of the natural states of this area, and the landscape comes alive when it is foggy. 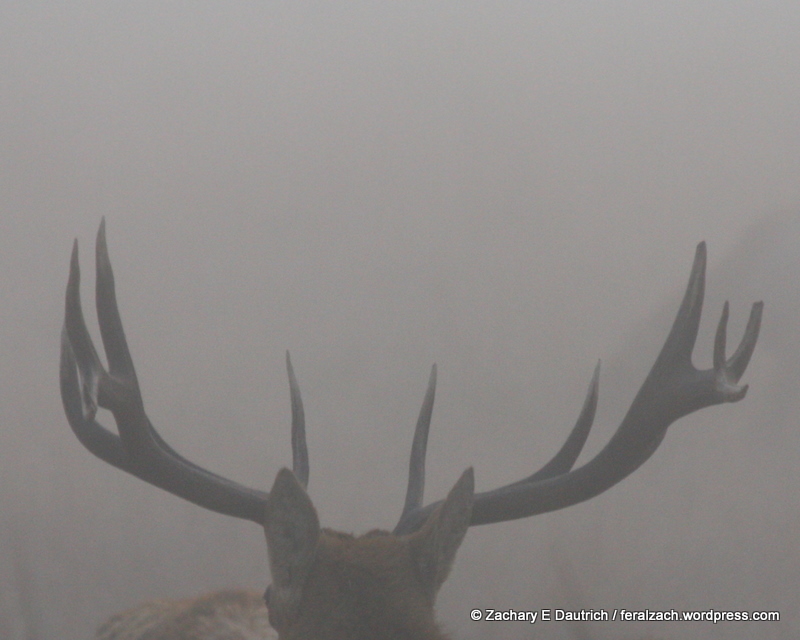 Not only that, the fog allowed us to get closer to the elk than we would have been able to otherwise, creating a smoke screen for us as we approached from downwind to find a nice rock outcropping overlooking two small herds. And, as an added bonus, most of the two-leggeds depart with the fog! Ironically, the best pictures I got were when we were leaving in our vehicle as a herd was milling about near the exit road. Vehicles can be the best blinds … and they’re mobile! 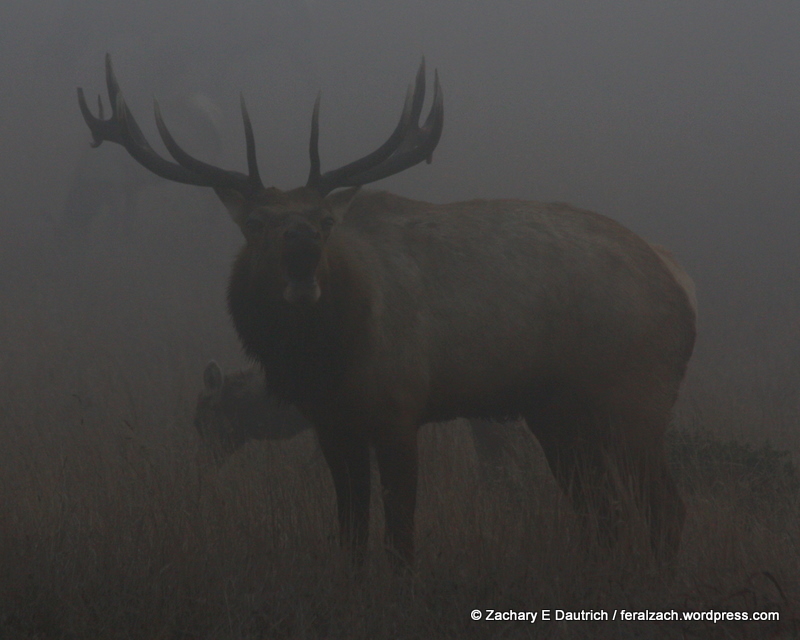 Oh, and the fog made a stunning scene for pictures. I caught this one mid-bellow!!!!!!!!! The sight and sound was incredible. 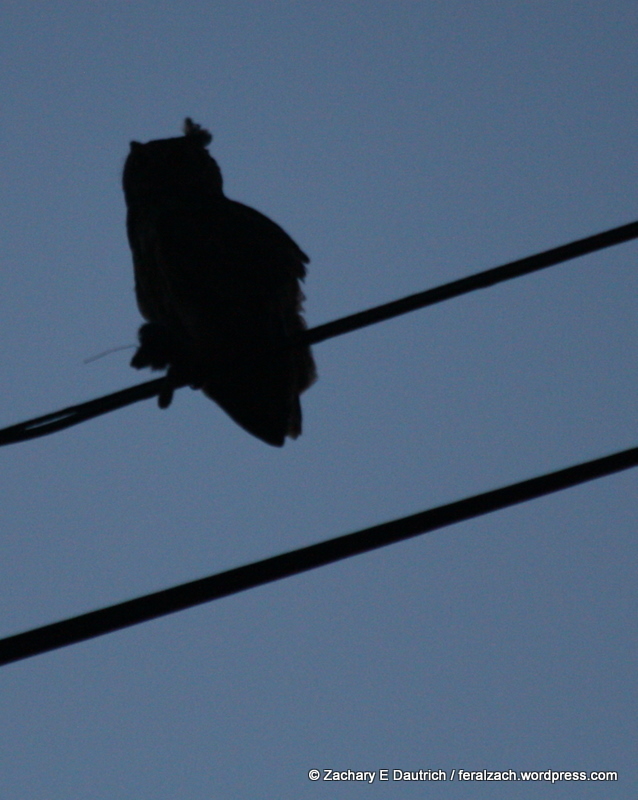 As we were leaving the Point Reyes area, heading East back towards the big city, we saw a great-horned owl perched on top of a utility pole, just a shadow highlighted by the twilight. We stopped to watch it, and suddenly we heard the unmistakable sound of a begging juvenile great-horned owl very close by. 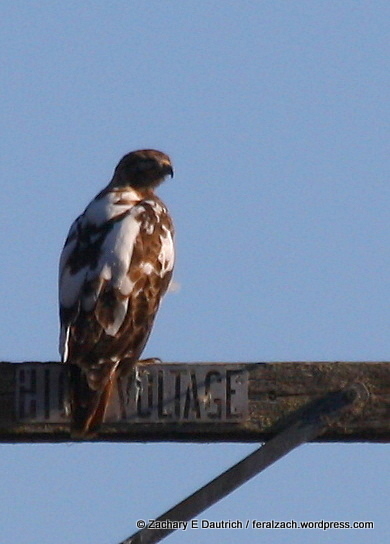 Within a minute or two, it had flown up to land on the utility wires, begging intensely for its breakfast. 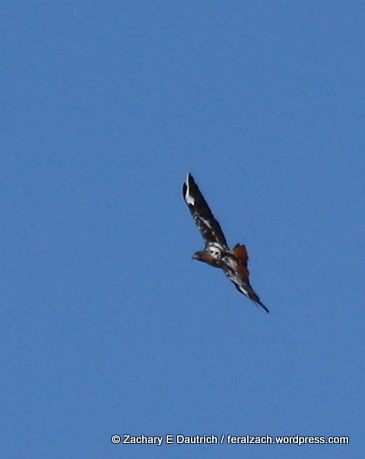 After shredding its prey, the adult jumped over next to the juvenile and handed it over. Oddly, the young one didn’t stop begging, it just perched on the wire with the food in its talons. The only time it paused was when I mimicked its begging call, at which point it would look at me for a few moments, then return to begging. 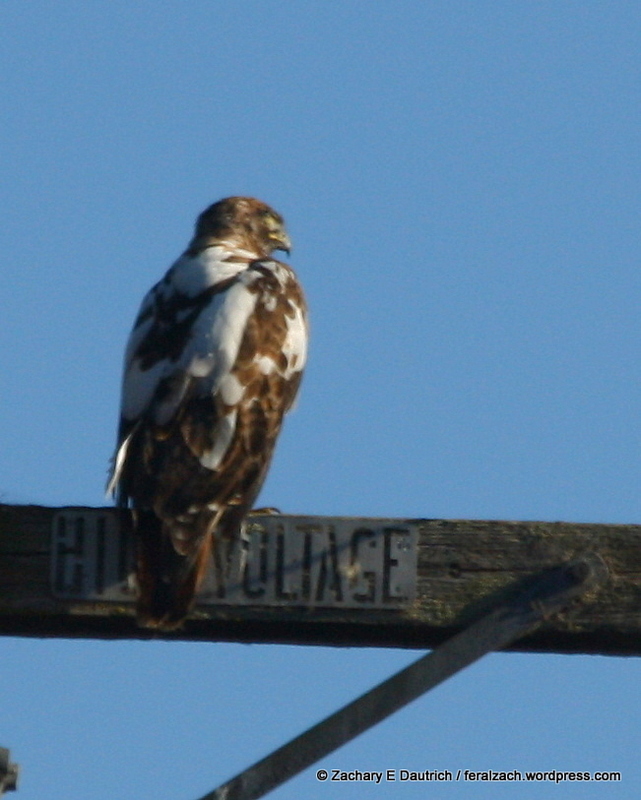 Must have been a spoiled young one … it does live in Marin County, after all. 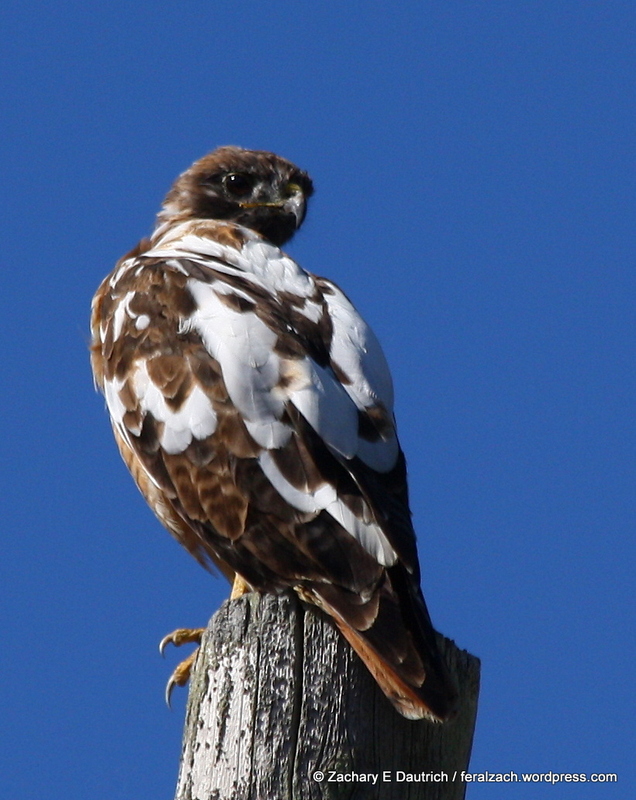 In drastic contrast to the “spirit” red-tailed hawk in the last post, I found this fella hunting here in Berkeley. 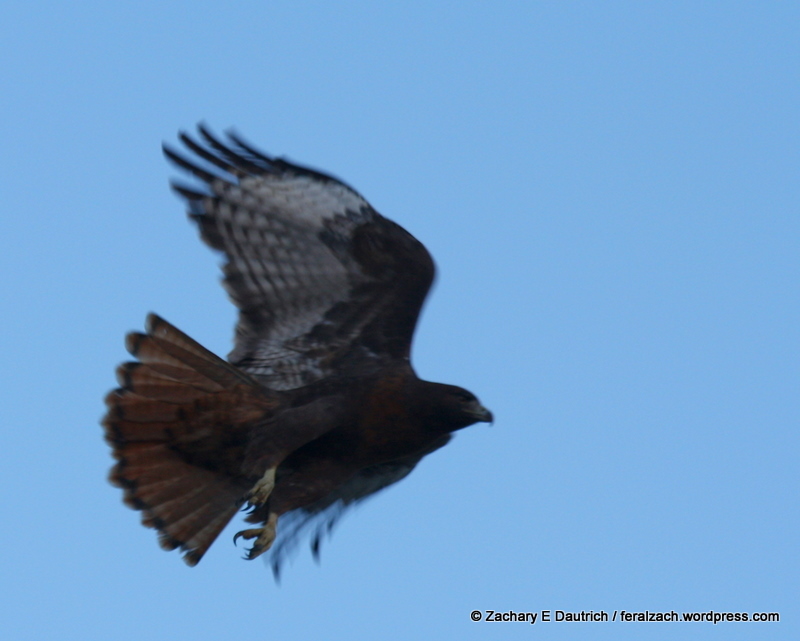 Red-tailed hawks are one of the most “polymorphic” hawks, meaning they show a large variety of individual plumage within the species. 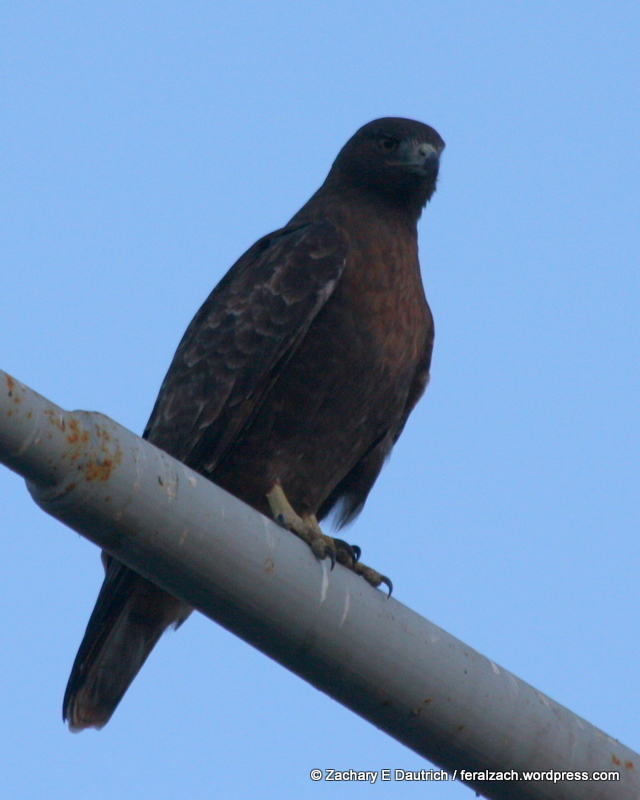 This one is a “rufous” or “intermediate” morph (in contrast to light morph, dark morph, or leucistic) – it’s entire body is dark brown – with a bit of a rufous or gold hue on his chest feathers – and its underwing coverts are dark as well (in contract to the flight feathers which are still white with dark banding). These are found more commonly here in the Western U.S., and I always am especially thrilled to see one as they are somewhat rare. And beautiful. The lighting wasn’t so good because the sun had already set behind some clouds/fog to the West. But you get the idea. 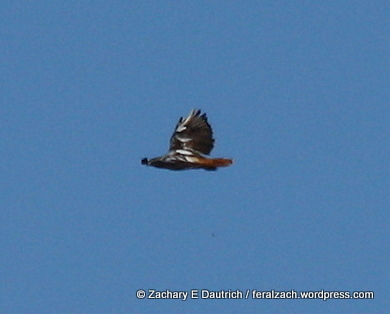 For some other pictures of a dark/intermediate morph red-tailed hawk, see my other post here. 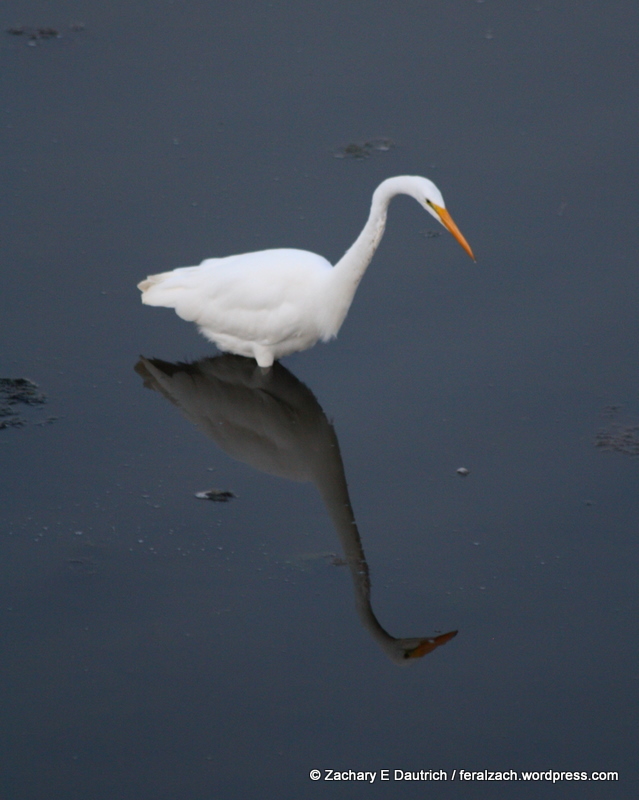 As I was biking home after the sunset, I was stumbled on a lone great egret looking for a last fish before dark. It was chased off while I watched, by a heron that swooped in almost on top it, squawking like how I imagine a pterodactyl must have sounded. The whole scene was prehistoric and awkward, with both the birds gangling wings and legs flailing about, finally leaving me in the relative silence of twilight between worlds … and between the Berkeley Aquatic Park and Route 880/580 during rush hour! 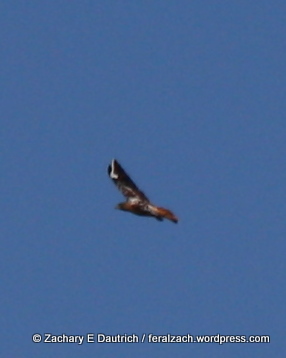 Thanks to a tip from Larry “the raptor magnet” Broderick of West County Hawk Watch, I was able to see another amazing bird yesterday. Leucism is a recessive gene defect that affects the pigment cells’ development in some parts or an entire animal, causing either the whole animal or some of its feathers, fur, hair or skin to be white. It’s similar to (but different than) albinism, which only affects the melanin pigment cells. 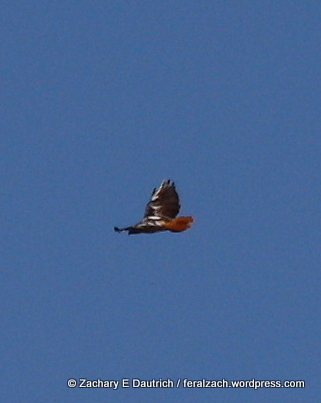 The effect can be really cool to see, as it is in this red-tailed hawk that I photographed in Sonoma County yesterday. Viewing the bird from the front or from underneath, it’s difficult to tell that it has different plumage than a typical red-tailed hawk, though on close inspection of it flying from underneath, you can see a couple of flight feathers that are all white. From a rear or top-down view while flying, it is obvious (and not easy to photograph!! I forgot to bring my jet pack yesterday). A bald eagle that I photographed last winter also has leucism, and it was striking. See those posts with pictures again here. 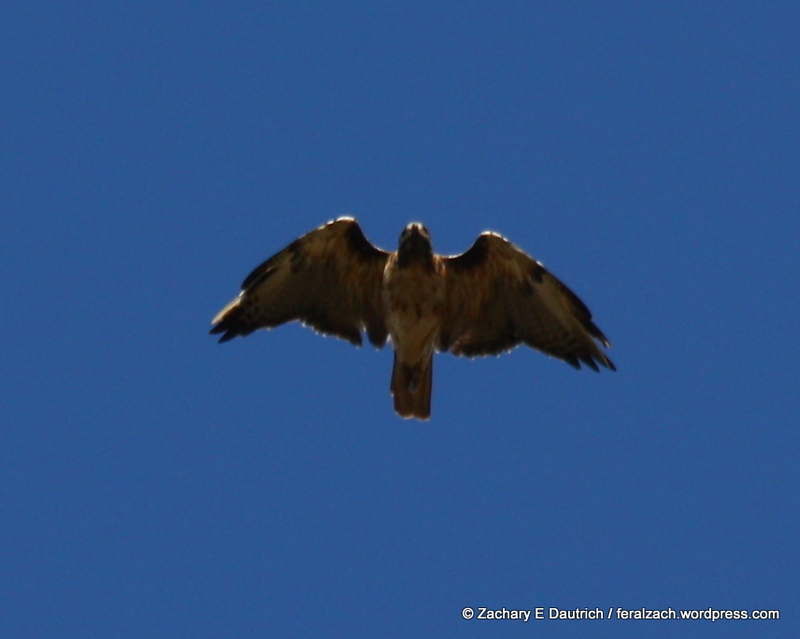 Another local raptor expert, George Eade, photographed an almost completely white red-tailed hawk here in the Bay Area a few years ago, his pictures can be seen here. The bird and the pictures are absolutely amazing. Impossible to go out in the Bay Area and find a camp spot without a reservation on a holiday weekend, you say? 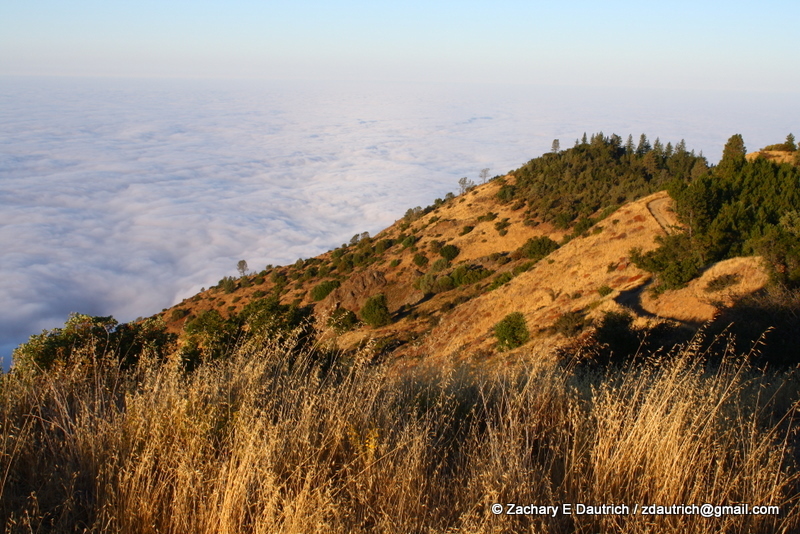 We decided to head to Big Sur for an impromptu wander on Sunday, and as the darkness and fog closed in on us, we passed campsite after campsite with signs posted “Camp Full.” We were undeterred. After a bit of searching, we stumbled upon a road that lead us into the mountains above the ocean cliffs. 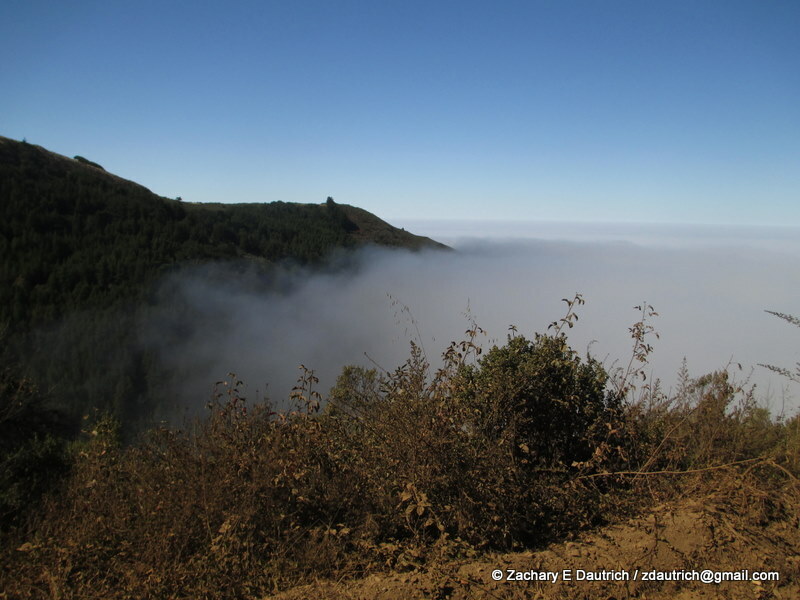 As we climbed up the dirt road, the fog grew so dense that at times it was difficult to see more than 10 feet in front of the vehicle. Up and up we went, snaking up the bending road this way and that, not knowing where we were headed. 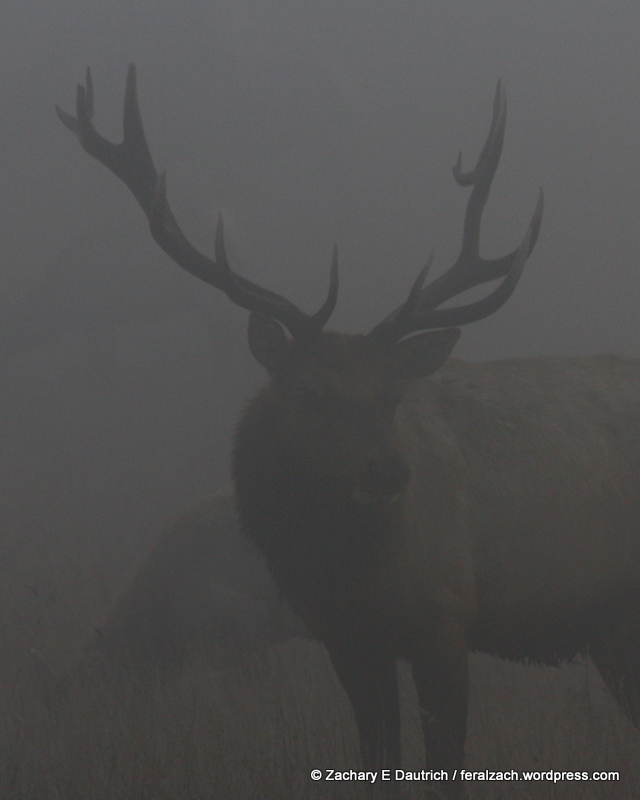 But something beckoned us on through the cold fog. Suddenly, the mist parted and we were treated to the just-past-full moon shining out at us through the bit of tree canopy above us! Still, we climbed, but with a little more hope in our hearts that we would find a good place to sleep. 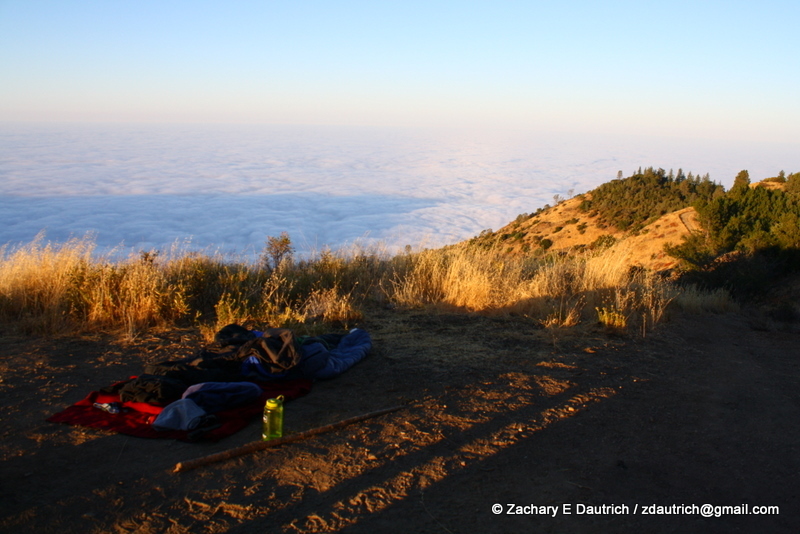 As if in a dream before we had even laid our heads down, we found ourselves a spot above the clouds, showered in moonlight. It was as if we were the only ones left in the world. 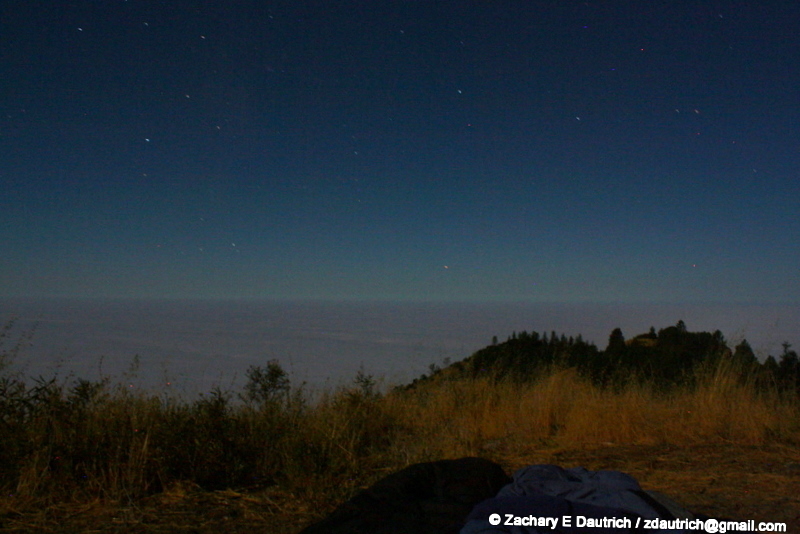 The stars twinkled at our feet above the layer of fog that was blanketing the ocean which lay thousands of feet below us, as the moon climbed higher in the sky behind our heads. A great-horned owl hooted to us in the distance, as we struggled to close our eyes to the beauty all around us so we could get some rest. In contrast to the cold damp foggy air below us on the coast, it was warm and still where we laid, with almost no need for covers. 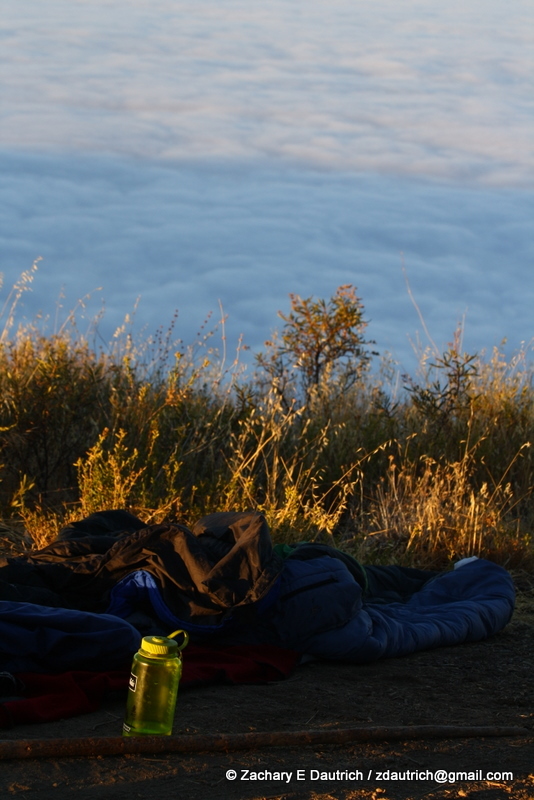 And certainly no need for a tent, which would only serve to obscure the view. It was so bright I could have read a book by the moonlight. In the morning I awoke several times before dawn in a half-sleep state, seeing the brightly shining planet Jupiter leading the sun up in the orange sky to the East. The moon still claimed the heavens though, sitting to the West in the purple light above the layer of fog over the Pacific Ocean. When I came to full consciousness at sunrise, the spectacle before us just became more surreal. We wandered around a bit before we left the area, going out west to the farthest point on one of the “fingers” of the mountain that stretched out towards the sea. The views were tremendous, both near and far. 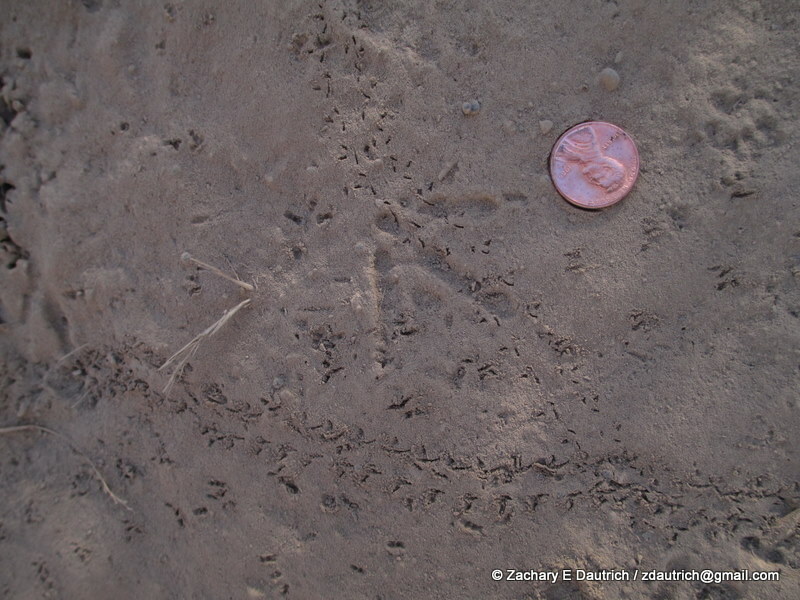 This one square foot of fine dust on the trail held so many tracks it was mind boggling, including those of rodents, insects, birds and a gray fox. As we headed back down the dirt road out of our dream world and into the fog below us, something on the side of the road caught my eye. 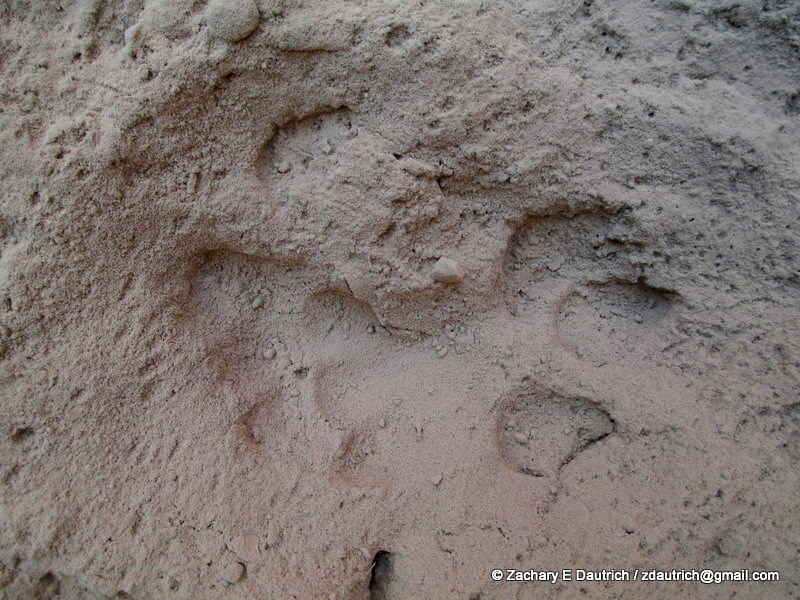 It was the tracks from our old friend, Mrs. Puma. She had passed on the road the night before, just as we had! 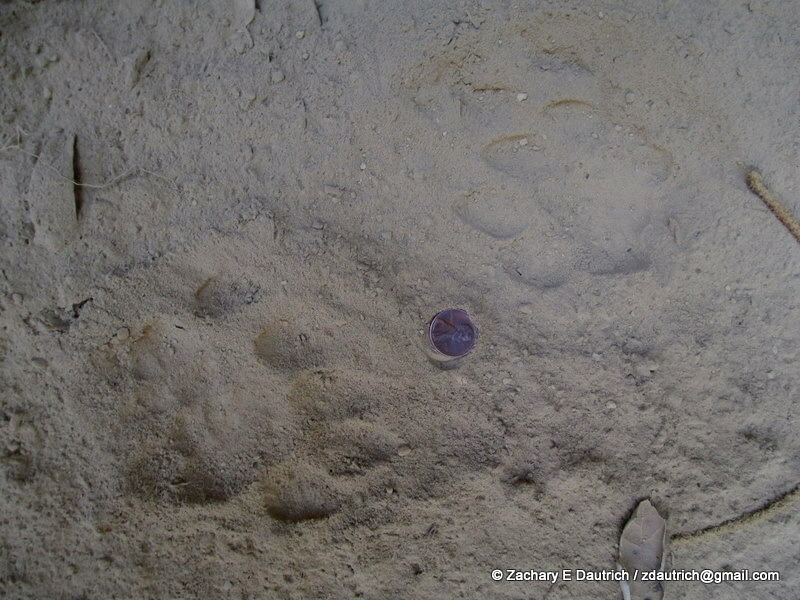 Sort of silly that I had just traveled all the way to Colorado and Wyoming to study them when they are all over the place here, her tracks seemed to say. 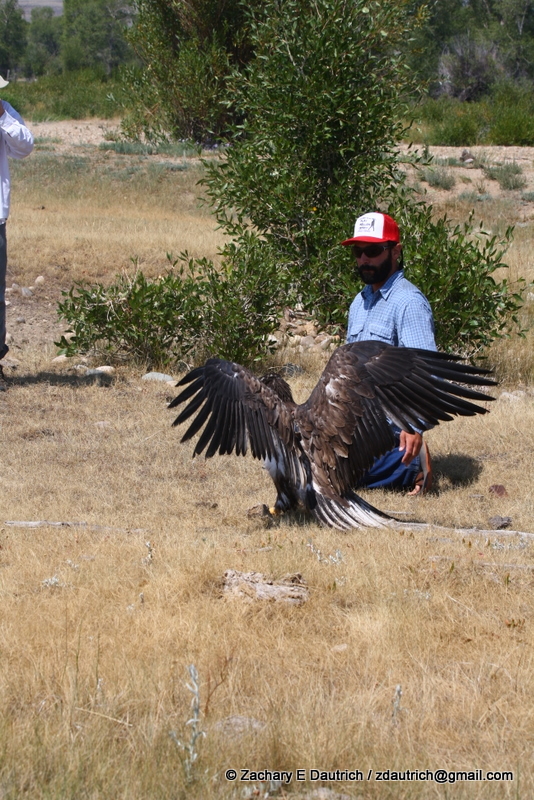 Last week before I left Wyoming, I was fortunate enough to get out in the field with Brian Bedrosian, who is the Avian Program Director at Craighead-Beringia South. 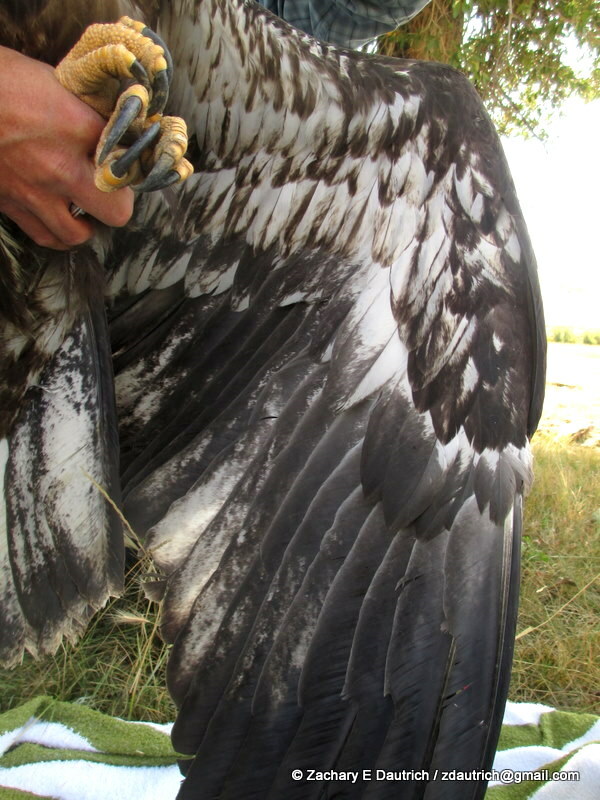 The task at hand was to catch a bald eagle, the last push to get the final of six transmitters attached to local bald eagles in the Upper Green River / New Fork River drainages, for a research project that is studying the effects of local energy extraction development on wildlife (aka gas wells aka fracking sights). For more on the details, see here. We spent 10 hours on the New Fork River on Wednesday, rowing down the low and slow water with Chief, Brian’s dog, directing us. To the East are the jagged peaks of the Windy Mountain Range, poking above the horizon eerily in the forest fire haze, and they look similar to the drastic edges and slopes found in the Teton Range. Meandering back and forth through the dry high-desert landscape is the New Fork River, a lush riparian zone that is home to many plants and animals, and a literal oasis.Everywhere else around us, as far as the eye can see, are sage-covered hills, slopes and small mesas – a sight which resembles a snapshot from the ocean, just beyond the breakers where the surface of the water is starting to peak and trough into rolling, moving hills of water. And, also as far as the eye can see, are natural gas extraction pads. So it is that this area is the center of much debate and ecological concern. We went through three separate bald eagle nesting areas during the float, using a trapping technique called a “float fish.” As we approached a nesting site, and there were eagles perched, we placed in the water upstream of us one or two of the float fish traps, then paddled quickly downstream ahead of them. These traps are essentially fresh-caught trout that have been modified with nooses of fishing wire and attached to a floating log with a few feet between the two. 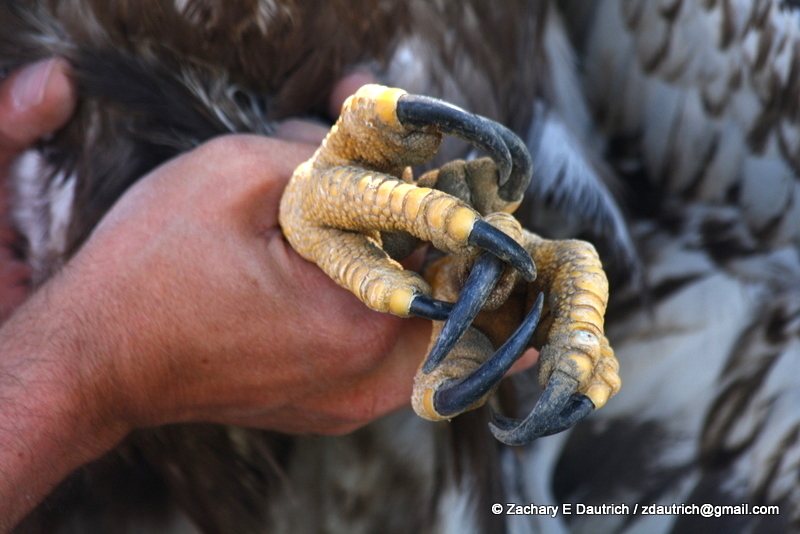 The concept is that when the eagle grabs the fish, the nooses secure around the eagle’s talons. The log is light enough that the bird can fly or swim safely to shore while we make our way back to grab it. Unfortunately the day yielded no results for our primary purpose (bald eagles trapped = 0), but it was a beautiful day to spend on a river. 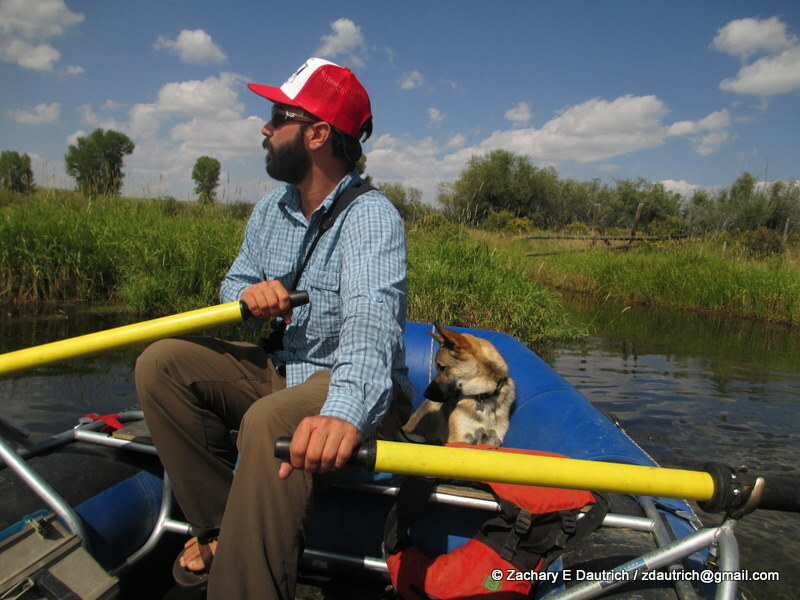 When your “work” entails floating and paddling down a river in August in Wyoming, life is good. The next morning, we took a different tactic and instead of floating down the river, we selected two known bald eagle perch sites that were accessible by foot. We readied traps early in the morning – with Trapper Haynam joining us, also from Craighead-Beringia South – and before sunrise set them floating in the river below two separate eagle perch sites. After setting the traps we monitored them from not far away, above the river banks. We then prepared for a long wait. 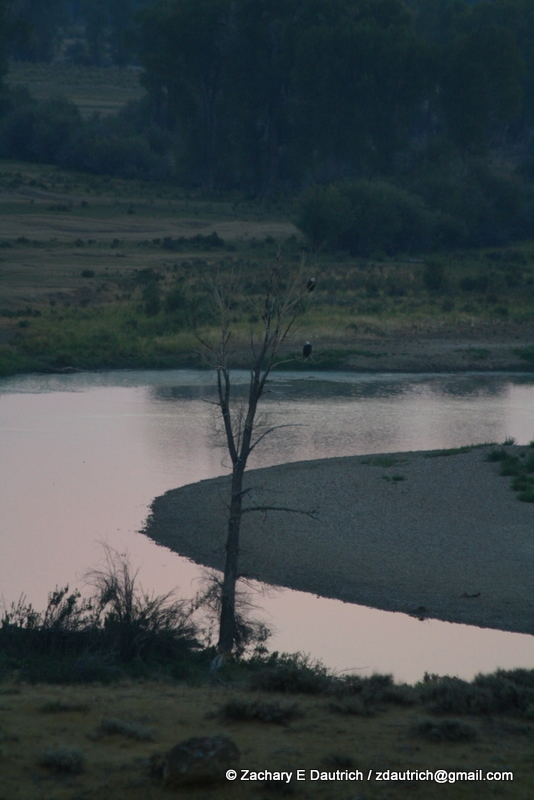 Suddenly, at 6:20 am, not 20 minutes after we had climbed back up the steep banks of the river to wait in the truck, an adult bald eagle soared over the fish and landed right by it! It seemed to toy with the fish and our emotions for a few moments, then after some careful scrutiny it took off. We hadn’t fooled it. Shortly thereafter a juvenile bald eagle came and circled above the fish a few times, then it was chased off by the resident adults who then perched upstream. It did not look promising. Now the real waiting began. We had no eagle action after the initial excitement, but we did have several bull moose move through the area, including one who seemed to walk directly over the fish trap. I was worried that maybe we suddenly discovered a mutant carnivorous zombie moose and that we would have to free it from the fishing cord after it tried to eat our fish, but luckily it was the regular non-zombie, plant eating variety. 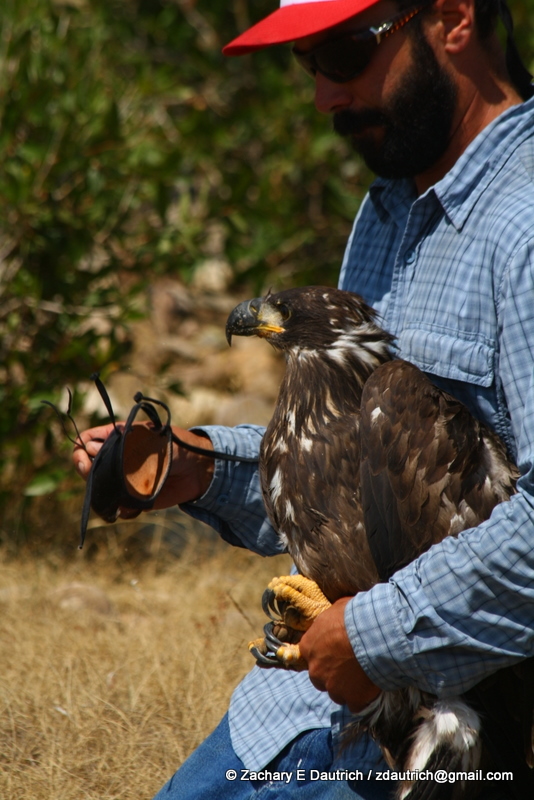 We decided that our setup was probably not going to attract any further attention from the eagle family, so we retrieved the trap and went to meet up with the rest of our crew at the other trap site that seemed to still hold some promise. The eagles hadn’t seen the fish yet but were in the area, and they had two of their young in the trees around them begging for food. My time there was limited as I had a long drive to do before the day was over, and just as I was about to leave for my drive back to California, we got one! 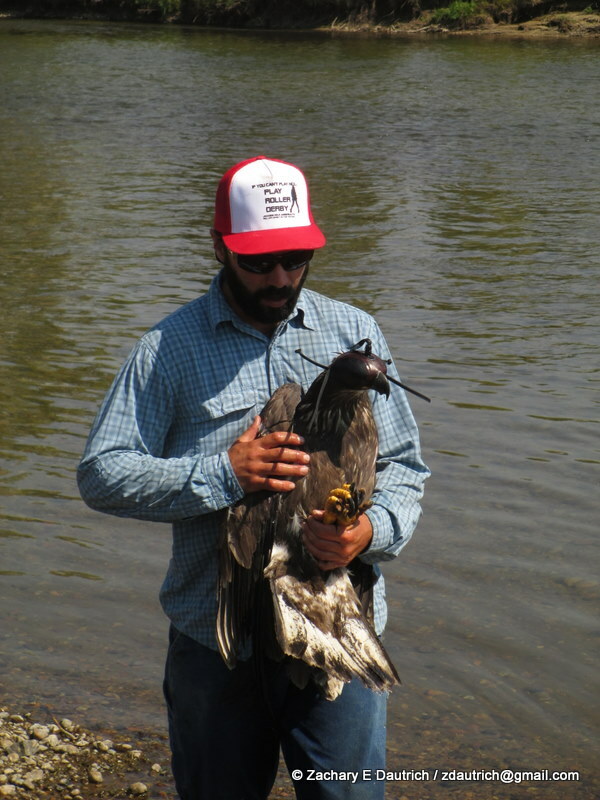 A hatch year bald eagle went for the fish, and although an adult was the preferred target, it could still be tagged for the study. Things happened VERY fast. We were posted up on a bluff above the river to monitor the trap, so when the bird hit it, we immediately drove down to the river bank, jumped out and ran to get close to it, before approaching the last bit of distance slowly and carefully. First priority was safety of the bird and us, and we didn’t want to create more stress than it was already experiencing. Brian handled it with amazing skill and professionalism. 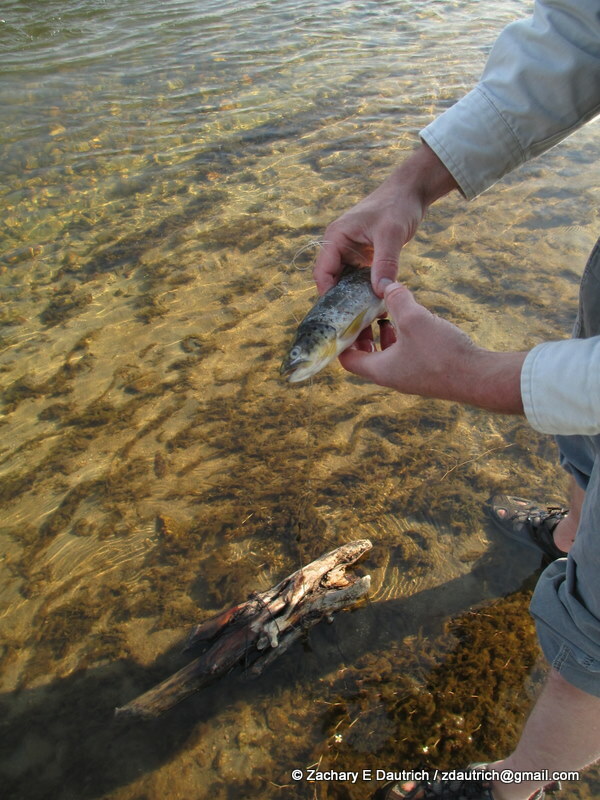 It had grabbed the fish, then when it realized it was caught, it flew/walked/swam over to a gravel bar in the shallow river where it was sitting when we got there. To minimize stress (for the bird and us! 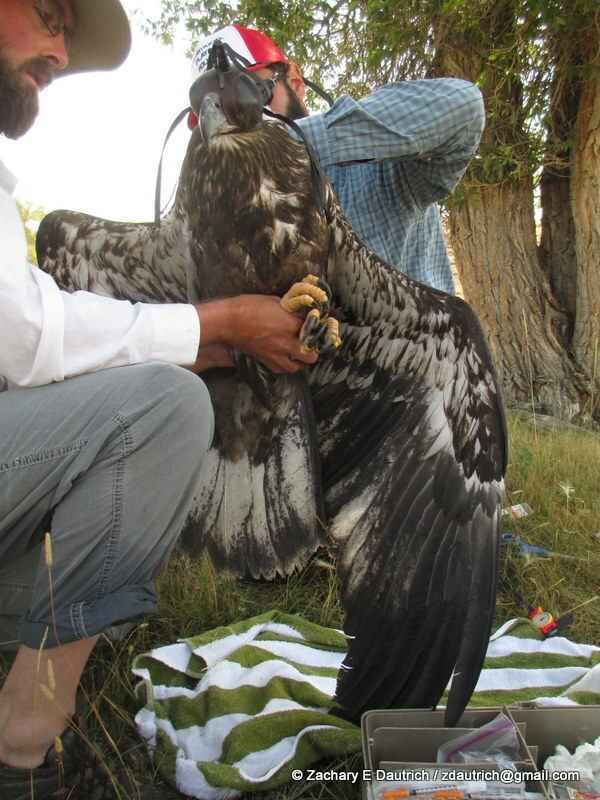 ), a falconers hood is placed over the head of the bird. This is also a common technique used in bird rescue and rehabilitation, and during exams of captive birds, because most birds tend to go into a hypnotized state of calm once the hood is over its eyes. The exam and attachment of the transmitter went quickly and smoothly. 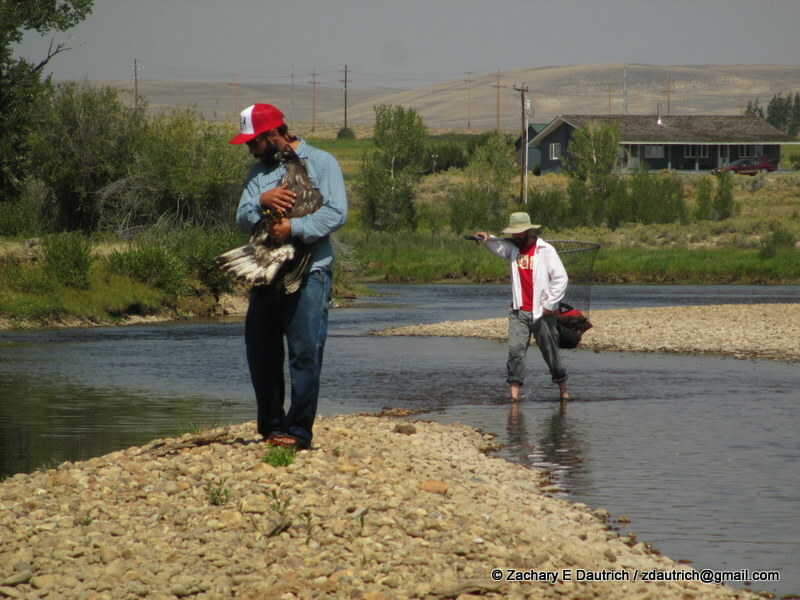 After feeding the eagle some trout and giving it some water to be sure it was hydrated after its ordeal, we released the eagle back onto the river. 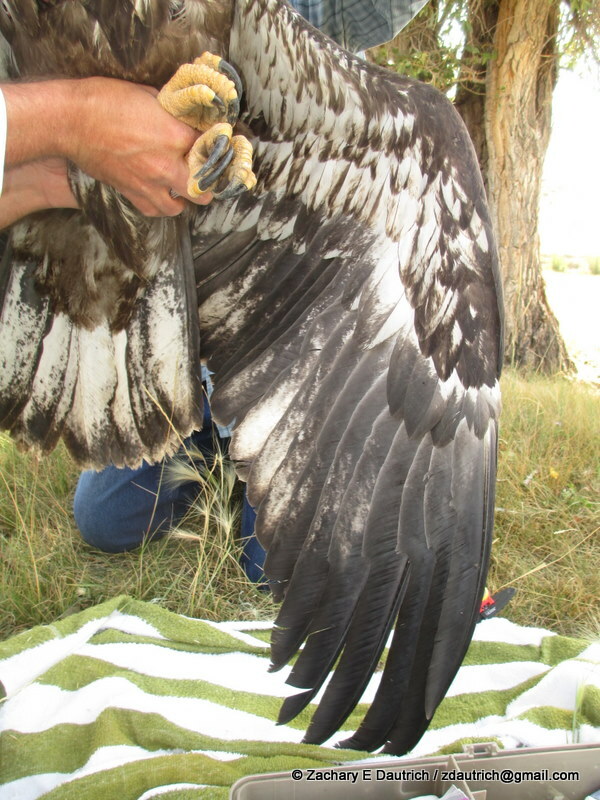 After the hood was removed and it was placed on the ground, it took a few seconds for it to get its bearings, then it flapped its gigantic wings and turned east, getting over a fence and landing in a stand of trees upriver. Mission accomplished. I must say that I had a lot of mixed feelings about capturing the bird, and about putting a transmitter on it, as the device is attached by strapping it around its body, and it sits on its back like a very small backpack. I find some solace in knowing that professionals like Brian are executing trapping like this in a professional manner and minimizing stress for the birds, and that these birds are participating in studies that could help the lives of many of their kind in the future. Your sacrifice does not go unnoticed. The visual and auditory impact alone of the gas pads is tremendous on the landscape. The night that we slept there amid them all on BLM land near the river, the remote area looked like it was covered with lots of small towns due to the number of lights. 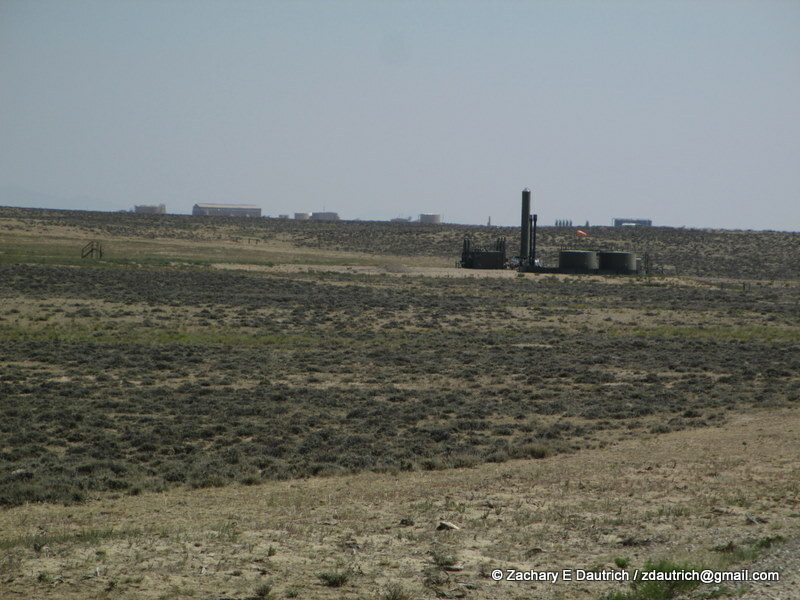 It wasn’t until morning that I realized most of these “towns” were drilling pads, with a few ranches interspersed. During the night, loud explosions occurred with regularity. Many people in the area believe that these extraction processes could be poisoning their air and water. The ethics and methods surrounding energy extraction are hot topics right now, and the long-term impacts on humans and the greater ecosystem have yet to be determined – but I know that I am certainly concerned. Nothing comes without a cost. I urge everyone to educate themselves about this issue and the next time you fill up your gas tank or turn on your stove, take a second to think about where your energy is coming from. And be thankful for it. 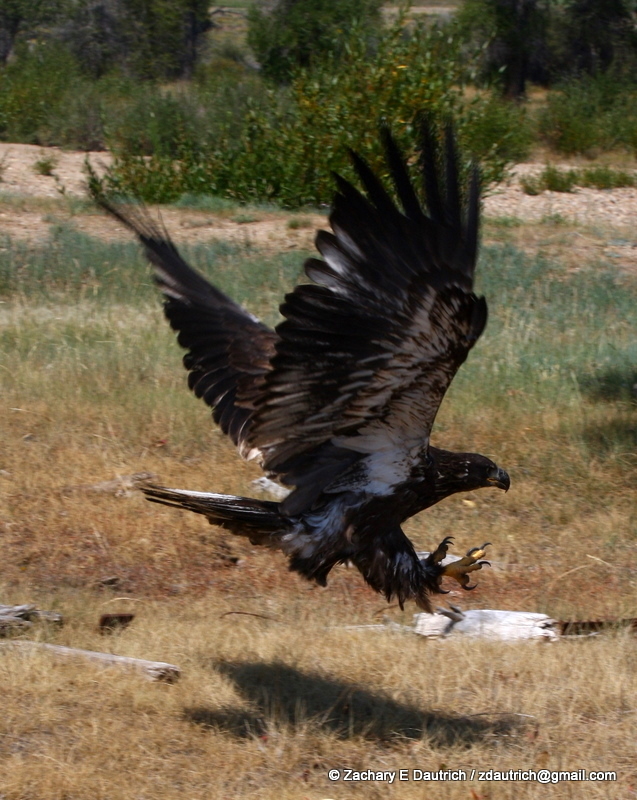 Good luck my eagle friend, I look forward to thinking of you and your kind flying free over clean waters for many generations to come. 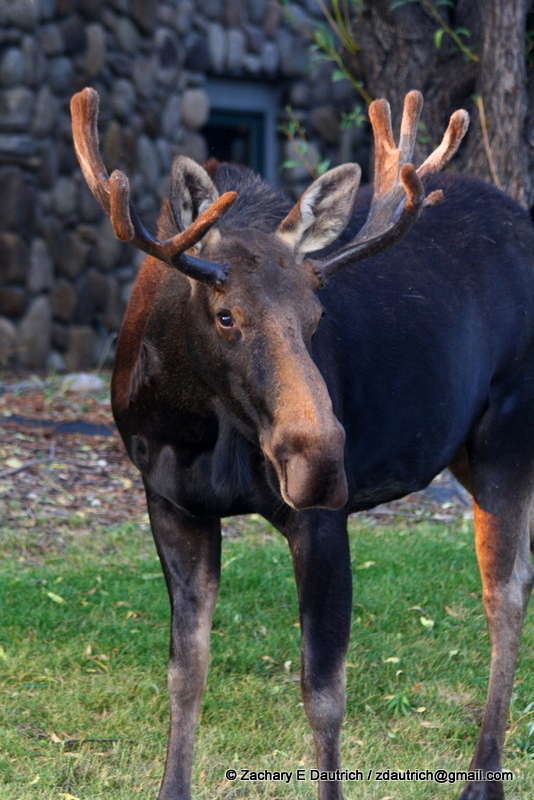 A young bull moose made his way through the small town of Kelly one evening, calmly browsing on roof-high trees and bushes. 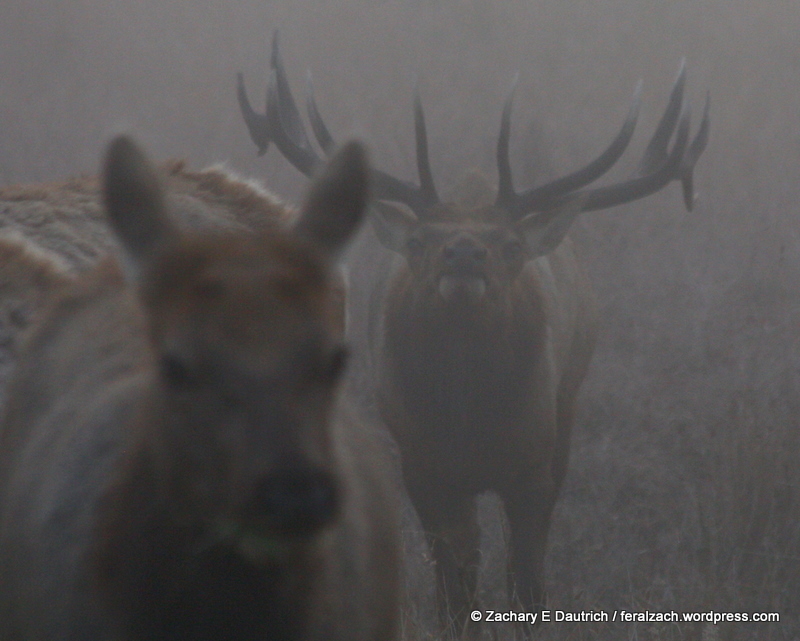 There are more than just grizzlies and wolves in the Tetons. As if wolves weren’t enough, the next day held more surprises. I left to go on a final hike that next afternoon, after packing up my jeep and preparing to leave Wyoming. 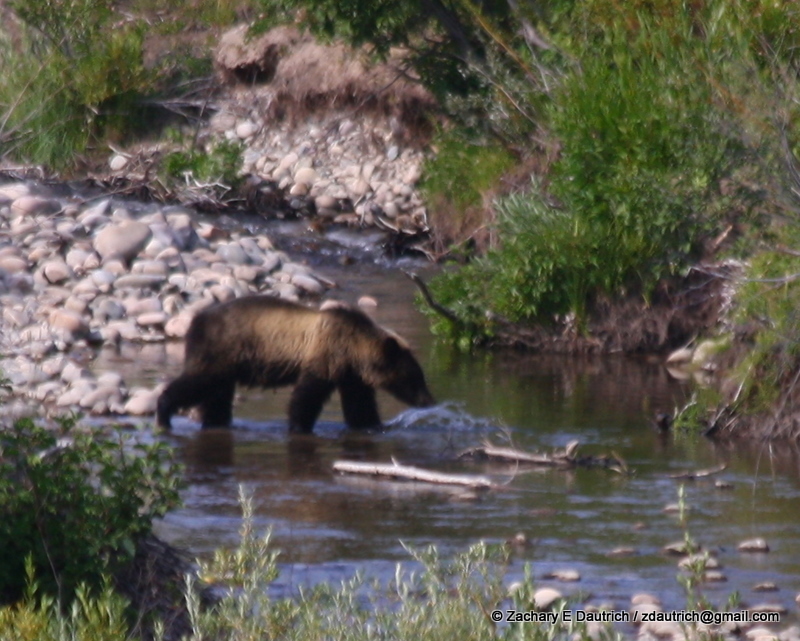 I joked to the project director that I’d seen everything but grizzlies and pumas in Wyoming, so I was going to find one or both that afternoon since my time in Wyoming was coming to an end for now. Sure enough, as I was almost to my hiking spot, I saw a large form crossing a stream just below me amongst the jungle of tall willows. 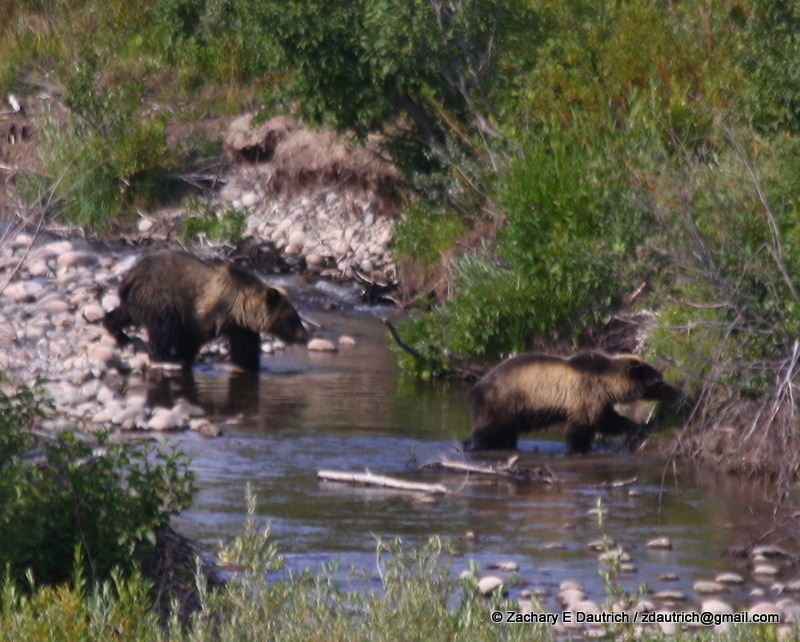 It was a sow grizzly and her three “cubs,” who were all about a year and a half old a just about as big as she is. I later learned that in all probability it was a grizzly known as “six ten,” and she even has her own facebook page (see here)! 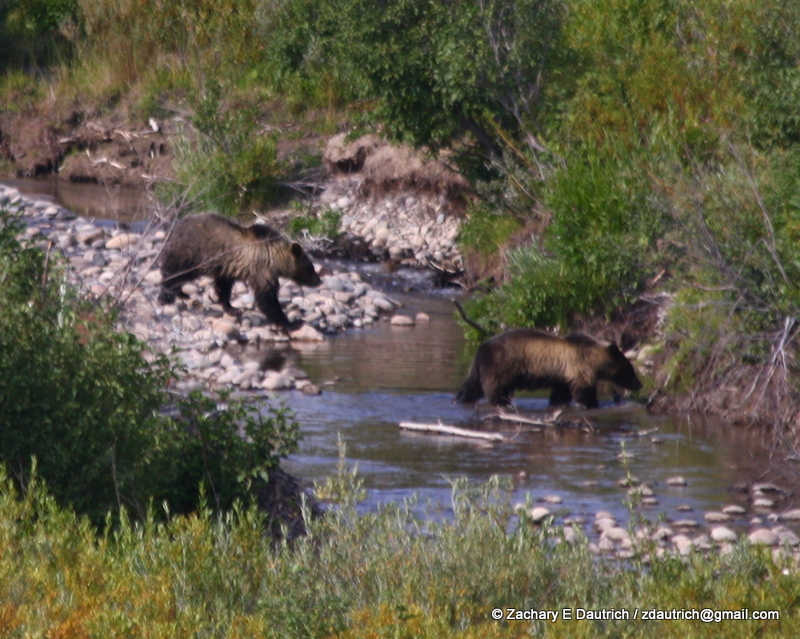 They had been hanging around the south side of Grand Teton National Park, even going out of the park and into some ranch land in search of food (the dry summer has created a food shortage for bears) before being “encouraged” back into the park (see here). The Park Service had closed a road near the visitor center for a few days because she and her cubs, along with a black bear and her cubs, were feeding by a road. Oh, and I guess she was charging at cars. Closing the road seems like it was a reasonable idea. Cancelling my hike there also a good idea. 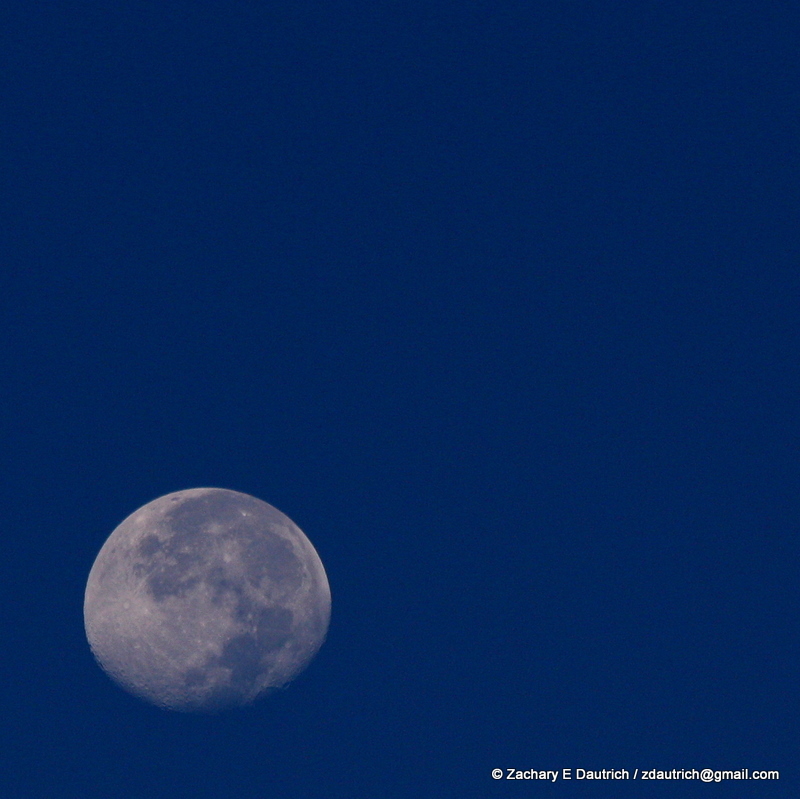 I saw them from about 300 meters, and our interaction was peaceful. Once again, seeing such a gigantic beast in the wild defies words. How they managed to disappear into the willows and not be seen again as I watched afterwards for an hour for another peek just defies reality. Where do four giant bears hide? The mystery endures for another time. I try to keep this blog apolitical, but I am bending my rule for this. I’d love if you took a minute to read this (if you haven’t already seen one of my pleas) – and if you feel moved – to add your name to a petition to help find a better solution for wolf management in Wyoming. These next two days are critical for the wolves of Wyoming, if you haven’t already please check out the following petition to endorse re-evaluating the proposed management plan by the Wyoming Fish and Game Department which goes into effect in two days. It includes unregulated hunting, trapping, and poisoning of wolves in the majority of the state. Seeing wild wolves was one of the most amazing experiences of my life. I want my children, and theirs as well, to be able to have that experience and be proud of the choices that we make today to protect these National Treasures of the United States and the Earth. I am not a liberal and I’m not a conservative. I’m a human being that understands that no issue is as simple as to have only two points of view. 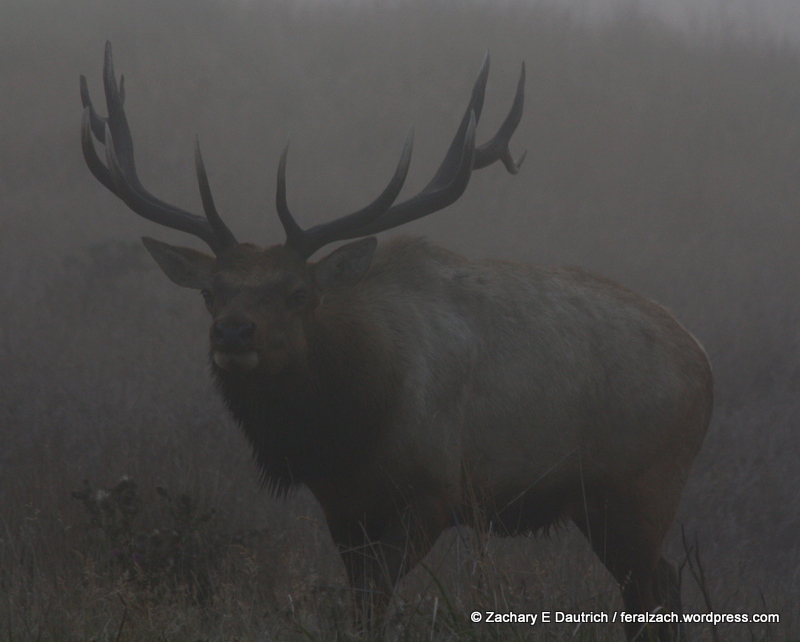 I understand that hunting is necessary for managing wildlife at this time, but I believe it should be done in a humane way with plans based on science and compassion. Wyoming’s plan includes neither. Wolves were removed from the Federal Endangered Species list last year, meaning the management of the species has been turned over to individual States. 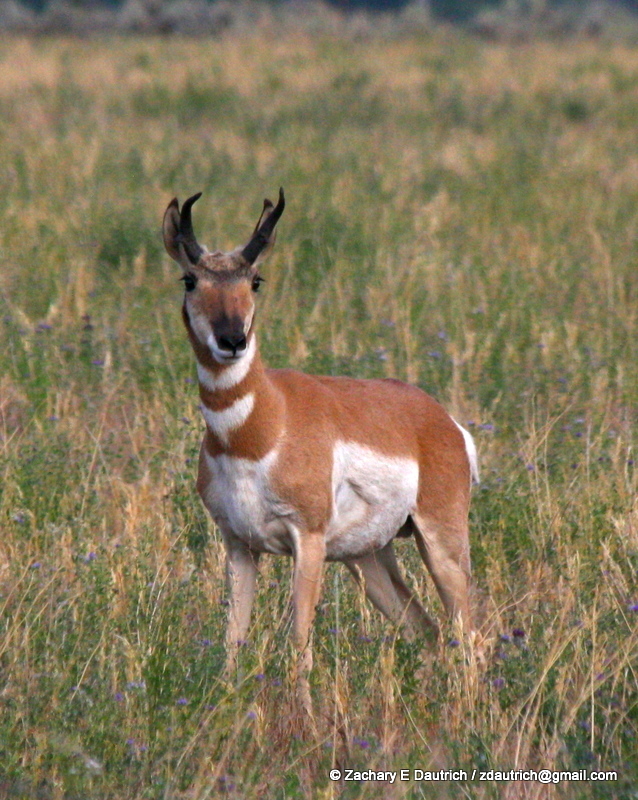 Montana and Idaho started management last year, and though their plans were approved by the Federal gov, they still include questionable methods that seem to endorse the old West mentality of extermination (outside of any National Parks) – though at least their hunting plans have some limits and regulations. To contrast bad and worse, Wyoming’s proposed “management” plan was so poor that last year the Feds would not turn over the responsibility until revisions were put into place. Any day now though, management will transfer from the Feds to the Wyoming Game and Fish Department, despite very few reasonable revisions. Wyoming’s current “management plan” includes categorizing the wolf as a “predator species” outside of Yellowstone National Park and Grand Teton National Park (and a small area just outside those parks). As a predator species, they will be subjected to unregulated hunting outside of those areas – they will be allowed to be shot, trapped, poisoned, or any other method of destruction, at any time, with no oversight. 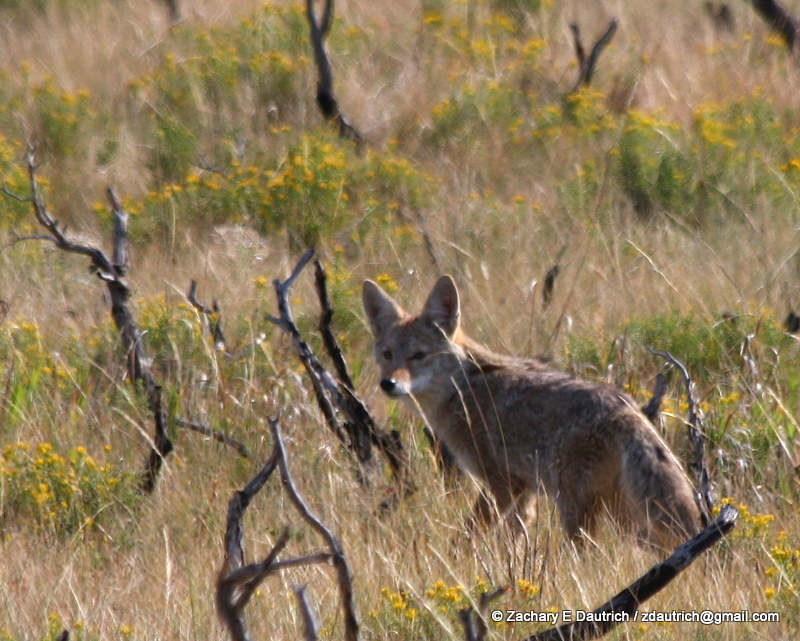 This plan is not far off the existing plans in states such as Texas that offer a dollar reward for every coyote killed. Wyoming’s management plan needs further revision, or the wolf needs to remain with some Federal protection. 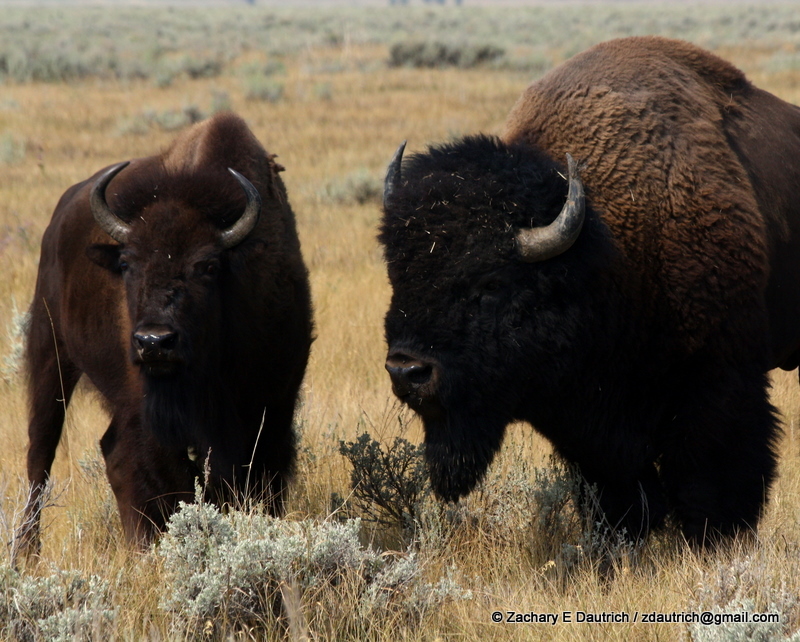 Wyoming is part of this Union of the United States of America, and they are stewards of many National treasures. I believe in States’ rights to govern, but there remain shared resources that belong to all of us. Wyoming should remember that many of their cities and towns exist because of the treasures within their state, and much of their income comes from people who come from outside the state to visit. Let’s come up with a plan that honors the people who have to live with wolves, the wolves, and our future generations. 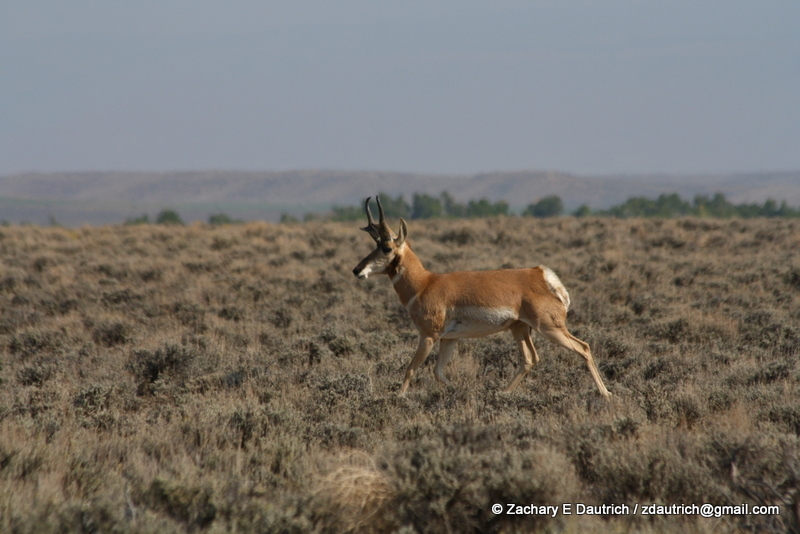 The proposed plan from Wyoming seems archaic and fear-based, not a plan based on science or even remotely including any compassion for a species that is directly related to animals that many of us keep in our homes and consider parts of our families. Anyone who has a dog or has experienced time with wolves knows that they are intelligent beings, live in close family groups, and experience some feelings similar to our own. Wolves, and other apex predators, are necessary parts of a healthy ecosystem, just as are all creatures right down to insects and bacteria (see this article). It is proposed that one reason deer ticks and Lyme’s disease is so out of hand in the Eastern United States is that deer populations, along with other prey species, have gone unchecked due to lack of predator influence, allowing the ticks to proliferate. The methods of “management” proposed by Wyoming include activities that I would associate with a 3rd world country. 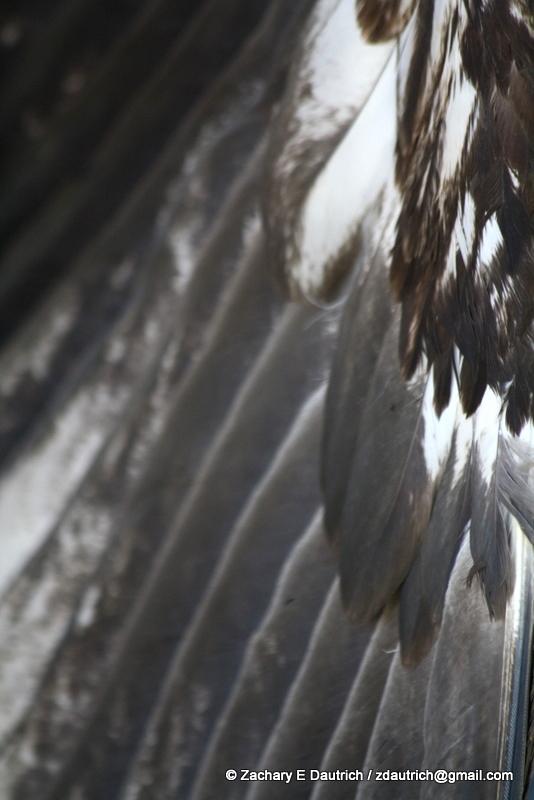 Let’s create a plan based on science and compassion, something we are proud of as citizens of the United States of America – something that can be a model for big predator wildlife management around the world. Poison and traps are horrific ways for an animal to die, and it is often a slow and painful death. Not only that, traps and poison have many other casualties in the form of other animals that aren’t targeted. I want my children and children’s children to be proud of the choices we make, not embarrassed that we reverted to the very tactics that put the wolf, bison, and many other animals in the position that they are in today. Thanks in advance for taking a moment to raise your voice in favor of a more humane, moderate and compassionate plan for managing these amazing animals!! !